After trying ubuntu for years and finding it too complicated the latest 12.04 got me intrigued. But after installing the Disk utility is giving me this error. I've searched here and there for a solution but they all seems to complicated for me. Is there a simple answer or do I have to repartition and reinstall all? Yours sincerely Kim Hansen, Denmark. This article explains this problem. The problem with misalignment lies with the partition editor. The partition editor that was used during installation defaulted to Rounding off to nearest cylinder. Whereas for newer installers it defaults to Rounding off to nearest MB. Back up, repartition, and restore. 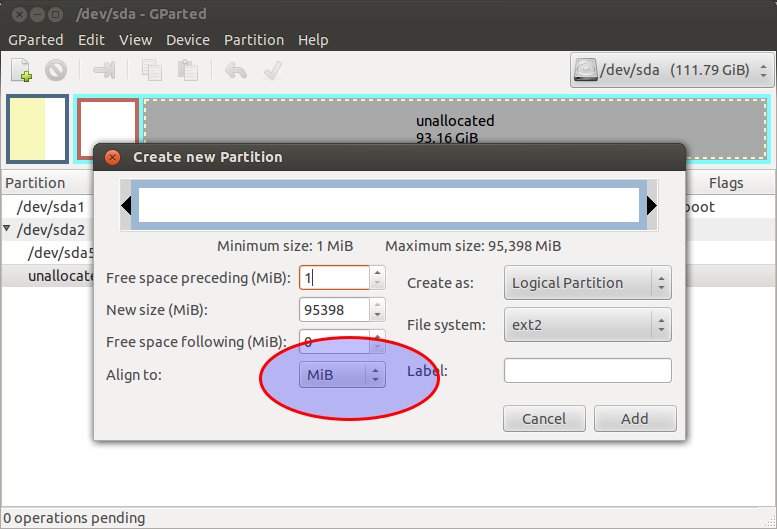 Use GParted to resize/move the partition that has a problem without backup. Here is the official document on resizing. It is old though and does not include the dropdownbox regating the MiB setting. Another one without images. Run the fcsk command for /dev/sda and /dev/sdb. Check the partition you are looking for with df. Your main drive partition is probably /dev/sda1. The reason I am telling you to do this from a live CD is because it is dangerous to do this while the hard drives are mounted. You also need root permissions to do this so precede the above fsck commands with sudo. Not the answer you're looking for? Browse other questions tagged 12.04 partitioning or ask your own question.